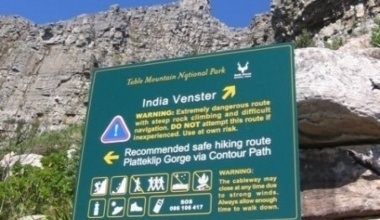 Possibly the most Googled Hiking Route on Table Mountain, the India Venster hike tackles Table Mountain front (North) face starting from Table Mountain Aerial Cable Station. A 3-4 hour hiking route suitable for any averagely fit person not to afraid of heights - there are some exposed sections mid-height which require elementary rock-scrambling / climbing and is ideal for a guided hike on Table Mountain for this reason. Come hike India Venster with us! Not your average hike! The hike is a varied offering of steep, even scrambling sections as well as some winding almost flat sections. 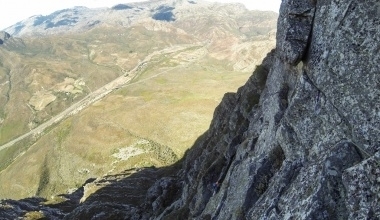 India Venster starts up the North Face of Table Mountain and weaves through the rockbands to a point 100m directly below the upper Cable Station. 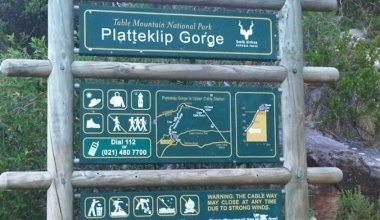 At this point the path darts around onto the West face and traverses the length of Fountain Ledge overlooking Camps bay and from there joins the final section of Platteklip Gorge up the last section to the summit. We have daily hikes leaving shortly after sunrise to avoid the sun-baked slopes which catch the sun an hour or two after sunrise due to their Northern aspect - by this time we aim to be deep in the gully and still in shadow. If the cable car is running, we take the 5min ride down, however it is important to be prepared to walk back down in the even that the car is closed due to strong winds. Guided Rock Climbing and Hiking is our trademark speciality. Table Mountain Climbing is a very unique experience with breathtaking views and solid rock. Suitable for complete beginners and experienced people alike. Climb Table Mountain with some of the most experienced mountain guides in South Africa. 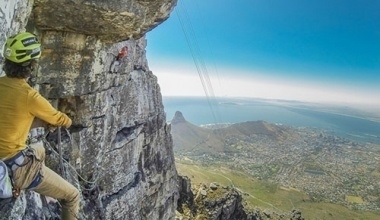 To Rock Climb on Table Mountain ranks very high (pun intended) on many climbers bucket list - whether you have just learned to climb, climb mostly indoors or if you are a seasoned pro. Nowhere else can you so easily access rock climbing of the highest quality, directly above a metropolitan city with ocean views to boot! Abseil in, climb out - come climb on Table Mountain with us! 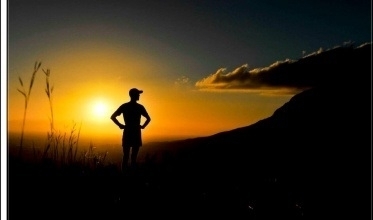 Climb Table Mountain with some of the most experienced mountain guides in South Africa. To Rock Climb on Table Mountain ranks very high (pun intended) on many climbers bucket list - whether you have just learned to climb, climb mostly indoors or if you are a seasoned pro. Nowhere else can you so easily acces rock climbing of the highest quality, directly above a metropolitan city with ocean views to boot! Abseil in, climb out - repeat. Come climb on Table Mountain with us! A traditional "ascent" of Table Mountain North Face - from bottom to top. This gives a great sense of having climbed Table Mountain and involves hiking then rock-climbing then some more hiking and then finish with more rock climbing. Total height-gain c650m with 8 pitches of rock climbing. We then descend via Cable Car, if it is running, else a 1hour walk down. An early start is required to avoid the sun. THE classic on Table Mountain. Clean and sustained climbing with a very airy travese in the middle, guaranteed to make you feel high. Simply exquisite, 'Jacobs' is not for those with a fear of heights. The best way to look down on the Camps Bay and Clifton dwellers, occassionally used to finish the integral ascent. Ideal for people who have climbed outdoors at the grade. The original finalè to the integral ascent, this route climbs the striking narrow face directly below the top cable-station. Often accessed via abseil this route offers suberb postion and easy climbing with views from the Atlantic all the way to false bay and is ideal for beginners. Remarkable for the grade! Perched high above the Western Seabord, this superb route weaves it's way around some of the most impressive (and difficult) cliffs of the mountian, and gives a sense of big, airy climbing at a very moderate grade. Oft used to finish the integral ascent. Ideal for the beginner or first outdoor climb. Table Mountain is home to the hardest (free) trad route in South Africa - as well as (one of) the easiest. As such there are a host of sustained and challenging routes on offer. If you seek something a little more challenging than those listed above, please contact us to set this up. Some of the finest technical, flowing climbing available at the grade! The climbing - move for move - is sustained and engaging with an airy traverse around a roof to add spice. Amazing route directly above the City. The Cederberg Mountain Range (read wikipedia)is a wilderness mountain range home to some of the finest single & multi-pitch climbing in South Africa. The summits top 2000m above sea level and the climbing is found on most aspects. This gives ideal locations to hide from the summer heat by hiking to elevation and then climbing on the shady faces or, in winter to climb in the sun at lower elevations. 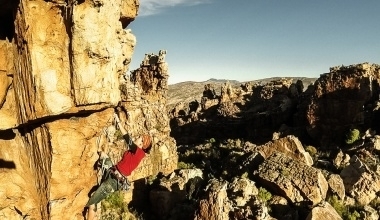 The climbing is on featured sandstone set on the Western edge of The Koue Bokkeveld - if you are looking for a feeling of wide open space, The Cederberg will give you that. Both of the above can accomodate begginers, intermediates, kids and adults alike. The oldest, easiest hike up the centre cleft of Table Mountain North face. The hike follows a steep but well maintained foot path and crests the table-top midway between the cable car and McClears Beacon - the highest point on Table Mountain. Guided Hiking on the oldest, easiest hike on Table Mountain. The route follows the centre cleft of Table Mountain North face ascending a steep but well maintained foot path and crests the table-top midway between the cable car and McClears Beacon - the highest point on Table Mountain. Hikes are graded for their technical difficulty and the grade is not necessarily an indication of how exposed or strenuous they are. Each hike does carry an indication for it's suitability level - easy | moderate | strenuous as well as an exposure rating out of three.